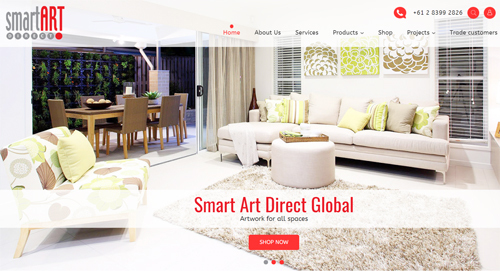 You are here: Home › Smart Art Direct launches new website and online shop! Mood-creator, style-definer, statement-maker…a beautiful artwork can do many things besides simply look good above the sofa. Along with the ability to alter a room’s ambience or even create an entire home’s identity, the right piece of art is a powerful medium that can evoke an unexpected emotional response. With just one glance, it can make us smile…change our mood…move us. Simultaneously improve both your home and your frame of mind? Art can do that. Over the past decade or so, Aussies have become house-proud like never before. Gone are the days of making do with hand-me-downs and/or mismatched furniture. Home decorating, especially DIY, has become a way of life, and the plethora of related reality TV shows has only served to inspire, encourage and motivate us – we have all become ‘hooked’ on interior design! In all of this decorating frenzy, one thing is noticeably clear, and that is that no self-respecting stylist’s work is complete without the finishing touch – the quintessential ‘icing on the cake’. Find and affix the perfect piece of art to the unadorned wall and…Voila! Home Sweet Home. Along with how you dress and the car you drive, the artwork you choose is an expression of your individual style. Beauty, as we all know, is in the eye of the beholder. To some, that means an abundance of colour, texture and movement – to others, it means simple, neutral and understated. There are no rights or wrongs when it comes to art – it is as individual as you are – and displaying your chosen pieces on the walls of your home or office is a wonderful way to proclaim your personality and make a space your own. Shopping for art can sometimes be daunting, not to mention tiring. 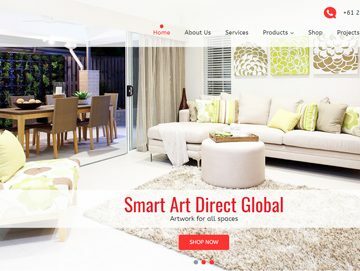 So with this in mind, we’d like to invite you to check out the new, eagerly-awaited Smart Art Direct website – featuring our easy-to-navigate, first-ever online shop! We know you agree with us that shopping should be fun and easy, and there’s nothing more frustrating than struggling your way around a website that is user-unfriendly. Well, struggle no more, as we’ve gone to great lengths to ensure that shopping online with us couldn’t be easier. Browse our amazing collection, each unique piece lovingly created by our team of talented artists using the latest design trends and colourways. For further ease of selection, each piece has been carefully categorised by style, colour and size. There is a huge range of affordable artworks for you to choose from, however we can also create a custom piece to suit your particular colour palette. To complement our extensive collection of affordable, hand-painted canvas artwork, there is also a stunning selection of sculptured wall art, wood carvings and decorative items.